When good friend Betty M. and I first laid eyes on the brilliant reds, golds, pinks and purples of Providence Canyon outside Lumpkin, we were amazed so few people know about it. Even more astonishing, we learned that rainwater and poor farming practices of the 1800s carved these massive gullies, up to 150 feet deep, in the hills; locals call it Georgia's “Little Grand Canyon”. A 3-mile looping trail with 20 breathtaking overlooks took us to the canyon floor, where we found caves sheltering beautiful wildflowers. Lumpkin is where U.S. Highway 27 meets State Highway 27 in southwestern Georgia, about 37 miles south of Columbus and 16 miles east of the Georgia/Alabama state line. 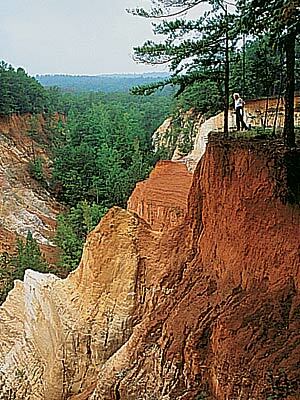 Providence Canyon State Park is 7 miles west of town on State Highway 39C. It's open 7 a.m. to 6 p.m. mid-September through mid-April; it closes at 9 p.m. otherwise. Parking costs $2 per day, but is free on Wednesday. Primitive camping is available for $4 per person. For more details call 1-229-838-6202.